I popped into WOS and have now been told September ( I’m on the register ). Wondered if anybody on the forum has been told similar and whether the delivery is starting to look like 2019? I was hoping for June as well (on a list) but I have heard elsewhere it seems to be slipping!!! AD I spoke to yesterday said they expect their first delivery to take place in July. Only 15 people on the UK wide list? I would have expected this to be in the hundreds. Maybe the demand isn’t what we think it is? When I placed a deposit in April at Fraser Hart in One New Change in London there were 3 deposits ahead of me and an interest list of 12 so 15 sounds a light number across the country. If the whole of Fraser Harts waiting list is blinking 15 people you’d think they get a move on. I mean they have the cases they can speak to their Rolex pals about the nice Pepsi Bezeis . There must be more than 15 people surely? Yeah sounds like a load of Baloney tbh. Why is it so unbelievable that there's only 15 people on a waiting list for a Tudor Black Bay? I find it unbelievable that there's a waiting list at all. A Tudor BB isn't in the same circle jerk as a Rolex GMT. I take your point but wasn't this one of the most attention grabbing watches at Basel? When people are expected to actually drop a deposit then the multi-listers tend to fade! However, the 50% deposit is fully refundable. It's an amazing piece though! How does 1st June sound".......? All our Basel ordered GMT's pre-sold with follow-up orders still being placed here in Nantwich. So? They'll be readily available like all modern Tudors so I imagine people will just wait until they're in store to try them on before making a decision. I was told that I am very much on the first batch for FH, I think 60 being the group buy for the first batch, and my deposit (10% - made during Baselworld) was in the fist 10. Since then I have re-confirmed, and the guy at Bristol confirmed their whole allowance for a few months was already sold, and that they did not expect to see a "stock" one to display until after the end of the summer. According to Rolex St James Square the Basel 2018 release models have started to be shipped from Geneva so should be hitting the stores shortly. Would be good to know if they all get shipped to different ADs at same time or if there’s a pecking order maybe based on turnover of watches ? I can apparently collect mine tomorrow if I decide I want it. AD had not asked me for a deposit. That’s not the issue. The issue is the cash has a tendency to burn a hole in my pocket. Surprised I’ve not bought something else instead. Waiting not my strongest suit. Last edited by jmitch; 31st May 2018 at 18:41. 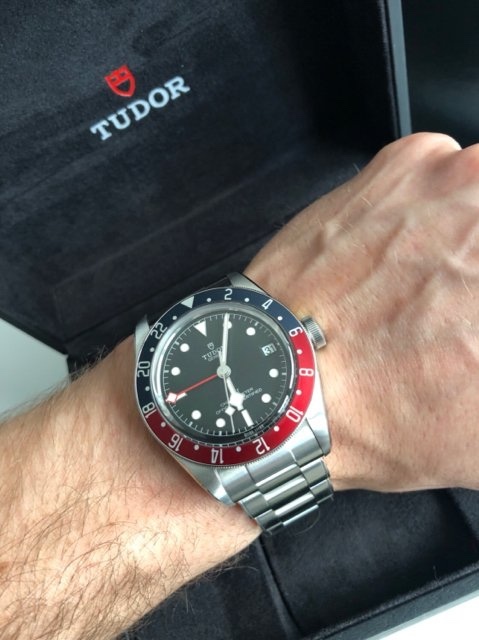 A guy on the Tudor Watch Club on Facebook picked his up today. UK based unsure where. That would be an I Tudor onesie! Surely no ones going to pay over list for a Tudor that will likely be freely available within a few months???? Ye - no longer interested in it - except he hasn’t collected it yet. Right. Unlike the Batman where the blue ceramic is overlaid on the black on the new Pepsi it's overlaid on the Crimson and this seems to reflect back through the blue making it look like a pale purplish lilacish lavenderish colour.